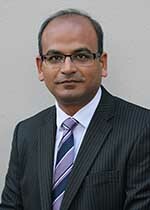 Dr Mukesh graduated in 2003 with distinction and undertook specialist training in oncology at Cambridge. He was awarded the Fellowship of the Royal College of Radiologists in 2010. From 2011-2013 he worked as a senior research fellow at Cambridge Breast Unit. His research work was based around the use of advance radiotherapy techniques including Intensity Modulated Radiotherapy (IMRT) and Image Guided Radiotherapy (IGRT) in breast cancer treatment. After successfully completing his research fellowship, he was appointed as Consultant in Clinical Oncology at Colchester University Hospital NHS Foundation Trust in 2013. He is now the lead oncologist for breast cancer and metastatic melanoma services in Colchester. In 2019, he was awarded Doctorate of Medicine from the University of Cambridge. He also received the Ralph Noble Prize for academic year 2017-18 from the Cambridge University for the high quality of his MD dissertation. Dr Mukesh has vast experience in the use of systemic chemotherapy, biological agents, hormone therapy and immunotherapy. His expertise includes oncological management of breast cancer, skin cancer including metastatic melanoma and Carcinoma of unknown primary. Dr Mukesh has an interest in medical education and is a faculty member for educational meetings organised by the Royal College of Radiologist (RCR) and the Royal College of Surgeons (RCS). He is also an educational supervisor for GP trainees. Dr Mukesh is actively involved in clinical research and is the research lead for Colchester Breast Unit. He is the local principal investigator of numerous clinical trials for both early and advanced breast cancer and accepts referrals from across Suffolk and Essex for Phase 2-3 clinical trials. Dr M B Mukesh does not hold a share or financial interest in this hospital, another Nuffield Health hospital or the company. Dr M B Mukesh does not have a share or financial interest in equipment used at this hospital or another Nuffield Health hospital. Dr M B Mukesh does not hold any paid advisory role(s) at this hospital or on behalf of Nuffield Health.